Google reports display ad spend flowing through Google Ads (formerly AdWords) under its Third Party Network Members segment. This segment also includes ad spend flowing through Display & Video 360 (formerly DoubleClick Bid Manager) and Google Ad Manager (formerly DoubleClick AdX, AdMob, and DoubleClick For Publishers). Our previous 2018 forecast assumed modest 6% year-over-year growth for Google Ads. While it is clear that Google Ads is experiencing decelerating growth, Google’s latest earnings report reflects a 10-15% year-over-year growth rate. We are revising up our estimate of Google Ads from $14.9B to $15.9B. Based on Twitter’s modest 2017 performance, we initially projected 13% year-over-year growth in managed ad spend. Twitter continues to outperform our expectations and accelerate its growth rate, so we are revising up our 2018 estimate. We now forecast $2.7B of 2018 ad spend, representing 27% year-over-year growth. Snap’s declining user base has been a drag on the company’s public market performance, but it appears to be more than compensating for this decline with improved monetization. While the company’s revenue growth is slowing, it is well ahead of our initial 2018 forecast. 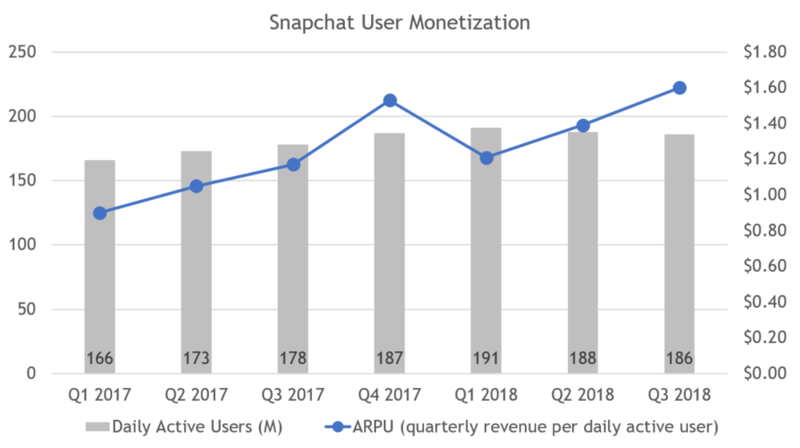 Achieving 40-50% year-over-year revenue growth while experiencing user declines implies dramatic improvement in average revenue per user (ARPU). Our math suggests Snap has nearly doubled ARPU over the past 7 quarters. Buyer feedback indicates prices are falling on Snapchat, suggesting ARPU growth is primarily driven by significant ad load increases. While this ARPU expansion in unlikely to be sustainable, it does require a significant upward revision to our 2018 forecast. We are revising up our forecasted year-over-year growth rate from 25% to 44%, representing $1.2B in managed ad spend. Criteo’s headwinds appear to be building. The company reported a second consecutive quarter of revenue declines driven by government-imposed (GDPR) and platform-imposed (Safari) targeting restrictions. We are revising down our 2018 ad spend forecast from $2.4B to $2.3B, yielding flat year-over-year growth. The company’s revenue ex-TAC and earnings continue to grow, which suggests to us a cut-to-growth strategy that is unlikely to be sustainable. Without a hard pivot away from retargeting, we do not see a path for Criteo to return to top line growth. It is worth noting that other independent ad tech platforms appear to be maintaining healthy growth rates. The Trade Desk’s most recent earnings report indicates a remarkable 50% year-over-year growth rate. We also continue to hear off-the-record reports of double digit growth from privately held buying platforms. Still, it appears to us that the industry’s narrative of share shift to the walled gardens is the defining trend of 2018 and will likely continue through 2019. Want a more detailed view of our market sizing forecast, including all sources and assumptions? Complete the following form, and someone from our team will be in touch within 24 hours. Thank you! Someone from our team will be in touch in the next 24 hours.